Sunday, February 12, 1809.Hardin County, KY.
"I was born Feb. 12. 1809 in then Hardin county Kentucky," wrote Lincoln in June 1860 for Thomas Hicks, "at a point within the now recently formed county of Larue, a mile, or a mile & a half from where Hodgin'sville now is. My parents being dead and my own memory not serving, I know no means of identifying the precise locality. It was on Nolin Creek." [Thomas Lincoln possessed 348½ acres of land when Abraham was born. Abraham's birthplace is approximately three miles south of present-day Hodgenville, on Nolin River. ]Memorandum Concerning His Birthplace, 14 June 1860, CW, 4:75-76. Thursday, February 12, 1835.Vandalia, IL. Lincoln votes yea on adding to property excluded from legal attachment one work horse or yoke of oxen. This provokes further discussion on exempted property. He votes yea with majority to pass "act for the benefit of Bank Debtors." He calls for yeas and nays on two votes in afternoon.House Journal. Monday, February 12, 1838.Springfield, IL. Lincoln votes for Francis Taylor for justice of peace. Marvellous Eastham, Democrat, is elected 236 to 198. Lincoln votes for Edward Stapelford who is elected constable.Election Returns. Tuesday, February 12, 1839.Vandalia, IL. House devotes afternoon to revenue bill. Hardin's amendment that taxes on lands owned by nonresidents be paid direct to state treasury is brought to vote. Lincoln favors amendment, but House does not adopt it. Motion to engross revenue bill fails. Lincoln votes yea.House Journal. Friday, February 12, 1841.Springfield, IL. Senate resolution providing five additional Supreme Court judges is amended to provide also for president, acting commissioner, and treasurer of canal board. Lincoln votes aye on amendment. Whig bill to suspend judiciary act is referred to Committee on Finance.House Journal. Monday, February 12, 1844.Springfield, IL. Lincoln buys pair of socks for Robert, aged six months, for 13¢.Irwin Ledger. Logan & Lincoln, for plaintiffs in Klein v. Irwin et al., and Irwin et al. v. Bell et al., file petitions for partition. Defendants are notified to appear at March term of the Sangamon County Circuit Court.Sangamo Journal, 15 February 1844. Wednesday, February 12, 1845.Springfield, IL. Silas W. Robbins, attorney for plaintiff in Lockridge v. Foster et al., moves court to amend decree in relation to interest. Lincoln resists motion. Record. With Joseph Gillespie, Lincoln examines Stanislaus P. LaLumiere, and recommends him for license to practice law. Recommendation for Admittance of Stanislaus P. Lalumiere to the Practice of Law, 12 February 1845, CW, 1:343-44. Friday, February 12, 1847.Springfield, IL. Lincoln appears for appellants in three cases before Supreme Court—Fell et al. v. Price et al., Anderson v. Ryan, and Wafer v. Storer et al. In Garrett et ux. v. Stevenson & Wardwell, decree of Tazewell County Circuit Court is affirmed in part, but Lincoln is substantially successful when court reduces appellees' claim by nearly half. 8 Ill. 261. Monday, February 12, 1849.Washington, DC. Lincoln votes to make bill relating to Department of Interior special order of day for February 16, 1849. It fails. Questions recurs of referring bill to Committee of Whole. This also fails, Lincoln voting nay. On question of ordering bill engrossed for third reading, Lincoln votes aye, and motion passes 111-76. Globe. Lincoln receives draft for $105 on Corcoran & Riggs, Washington bankers, evidently legal fee. CSmH—Original. 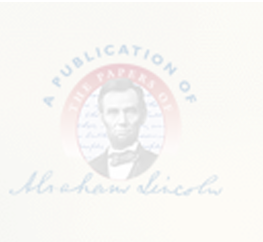 Lincoln writes to David Davis, of Bloomington, Illinois, regarding the numerous individuals who seek patronage positions, specifically that of the Commissioner of the General Land Office. Lincoln writes, "Out of more than . . . three hundred letters received this session, yours is the second one manifesting the least interest for me personally. I do not much doubt that I could take the Land office if I would. It also would make me more money than I can otherwise make. Still, when I remember that taking the office would be a final surrender of the law, and that every man in the state, who wants it himself, would be snarling at me about it, I shrink from it." Abraham Lincoln to David Davis, 12 February 1849, CW, 10:14; Thomas F. Schwartz, "'An Egregious Political Blunder' : Justin Butterfield, Lincoln, and Illinois Whiggery," Journal of the Abraham Lincoln Association 8 (1986): 9-19. Lincoln's Springfield bank account is debited $27 for payment to Bela C. Webster. Irwin Journal. Wednesday, February 12, 1851.Springfield, IL. Lincoln spends 7¢ for pound of nails. Irwin Journal. Saturday, February 12, 1853.Springfield, IL. Senate unanimously passes bill making town of Lincoln Logan County seat. House and Senate Journals; Lawrence B. Stringer, ed., History of Logan County, 2 vols. (Chicago: Pioneer Publishing Co., 1911), 1:221. Thursday, February 12, 1857.Springfield, IL. Lincoln replies to firm of attorneys in Paris who sent claim against Illinois Central. "I have been in the regular retainer of the Co. for two or three years;" he writes, "but I expect they do not wish to retain me any longer." He adds that he is going to Chicago on 21st and will ascertain his status. If discharged, as he expects, he will be glad to handle claim. Abraham Lincoln to James Steele and Charles Summers, 12 February 1857, CW, 2:389. Indianapolis, IN and Cincinnati, OH. Tuesday, February 12, 1861.Indianapolis, IN and Cincinnati, OH. After breakfasting at governor's mansion, Lincoln accompanies Gov. Morton (Ind.) to Capitol, where he exchanges greetings with members of legislature. William E. Baringer, A House Dividing: Lincoln as President Elect (Springfield, IL: Abraham Lincoln Association, 1945), 271-72. Shortly after 10 A.M. he appears for third time on balcony of Bates House and, in response to crowd which had gathered, makes practically same remarks as on previous evening. Remarks from the Balcony at Bates House, Indianapolis, Indiana, 11 February 1861, CW, 4:196; Villard, Eve of '61, 79. Welcomes Mrs. Lincoln and sons to presidential party and takes affectionate leave of old Illinois friends, Jesse K. Dubois and Ebenezer Peck. Evening Star (Washington, DC), 14 February 1861, 2:4; Villard, Eve of '61, 80. Boards train at 11 A.M., escorted by governor and committee from legislature. Evening Star (Washington, DC), 14 February 1861, 2:4. Meets welcoming committee from Ohio and Kentucky on train. Cincinnati Commercial, 14 February 1861. Speaks from rear platform at Indiana towns of Morris, Shelbyville, Greensburg, and Lawrenceburg, during four-hour ride to Cincinnati. Baltimore Sun, 13 February 1861. Arrives in Cincinnati shortly after 3 P.M., receives immense ovation, and is welcomed by Mayor Richard M. Bishop. Evening Star (Washington, DC), 14 February 1861, 2:4. Rides in carriage with mayor, escorted by Washington Dragoon regiment, for two hours and arrives at Burnet House, where he addresses huge crowd: "I hope that, although we have some threatening National difficulties now—I hope that while these free institutions shall continue to be in the enjoyment of millions of free people of the United States, we will see repeated every four years what we now witness." N.Y. Tribune, 13 February 1861; Cincinnati Commercial, 13 February 1861; Speech at Cincinnati, Ohio, 12 February 1861, CW, 4:197-200. Attends public reception in hotel dining room during evening. Goes to balcony at 8 P.M. and speaks to several thousand members of German Industrial Association: "I deem it my duty—a duty which I owe my constituents—to you, gentlemen, that I should wait until the last moment, for a development of the present national difficulties, before I express myself decidedly what course I shall pursue. . . . Mr. Chairman, I hold that while man exists, it is his duty to improve not only his own condition, but to assist in ameliorating mankind; and therefore, without entering upon the details of the question, I will simply say that I am for those means which will give the greatest good to the greatest number." Speech to Germans at Cincinnati, Ohio, 12 February 1861, CW, 4:201-3. Wednesday, February 12, 1862.Washington, DC. President transmits to Congress treaty with King of Hanover for abolition of "Stade Dues." Abraham Lincoln to the Senate and House of Representatives, 12 February 1862, CW, 5:131-32. Spends much time with sick son Willie. Nicolay to Bates, 21 February 1862, John G. Nicolay Papers, Library of Congress, Washington, DC. Thursday, February 12, 1863.Washington, DC. Gen. Thomas F. Meagher interviews President on behalf of Cols. Robert Nugent and Patrick Kelly. Abraham Lincoln to Henry W. Halleck, 12 February 1863, CW, 6:101. Lincoln holds conference with Secs. Stanton and Welles and Gen. Halleck on task of patrolling rivers. Abraham Lincoln to William S. Rosecrans, 12 February 1863, CW, 6:101. Summons Asst. Sec. Fox to White House for information on Charleston expedition. Gustavus V. Fox, Confidential Correspondence of Gustavus Vasa Fox, 2 vols. (New York: n.p., 1918), 1:178. Transmits to Senate: 1. report and documentation relating to mediation, arbitration, and similar measures looking to termination of existing civil war; 2. nomination of former Comdr. Preble to be commander on active list; 3. nomination of former Comdr. Roger Perry (USN, commission expired) to be commander. Abraham Lincoln to the Senate, 12 February 1863, CW, 6:101-2; Abraham Lincoln to the Senate, 12 February 1863, CW, 6:102; Abraham Lincoln to the Senate, 12 February 1863, CW, 6:102-3. Friday, February 12, 1864.Washington, DC. "Little of particular importance in the Cabinet meeting." Welles, Diary. President writes Sec. Chase: "I have felt considerable anxiety concerning the Custom House at New York. . . . I am convinced that he [Hiram Barney] has ceased to be master of his position. . . . I propose sending Mr. Barney Minister to Portugal, as evidence of my continued confidence in him." J. F. Bailey, special agent of Treasury, assumes to be collector. Public interest will suffer in his hands. Abraham Lincoln to Salmon P. Chase, [12 February] 1864, CW, 7:181.